Prepare to change your thinking! Many Christians understand that the Church of Rome was very different from the apostolic church. The early church was headquartered at Jerusalem, described by ancient sources as the most beautiful city in the world, far surpassing Rome. The most beautiful building in that city was the Temple. This was all to change when the Jewish Revolt led to the Roman destruction of the city and temple in 70 A.D.
Popular history has it that the Apostle Peter was the first pope and that he lived in Rome. The Bible shows this to be untrue. Even the title of pope is unbiblical. Most people are aware that the Roman Emperor Constantine played a pivotal role in giving the Roman church the pre-eminence in Christendom in 325 A.D. However, this did not end the controversies and divisions, which continued. In the late fourth century, Pope Damasus commissioned Jerome, considered at the time the greatest scholar in the “Christian” world to produce an authoritative Latin translation of the scriptures, which would put an end to the various Latin manuscripts that were circulating. Jerome’s Latin Vulgate was finished in 405 A.D.
“The corrupt Roman church first re-arranged the entire NT to emphasize a gentile or pagan message. In his Latin Vulgate Jerome removed the epistle of James the Just from its prominent position after the book of Acts – where it appears in nearly all the Greek manuscripts. He placed it near the end of the NT, after the epistles of Paul. 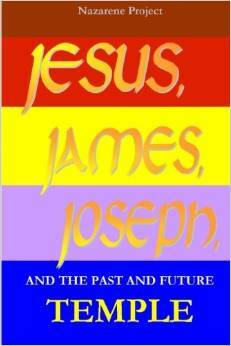 The three paragraphs I have quoted can be found in the book “Jesus, James, Joseph and the past and future Temple” (pages 320 & 659). The book is available through Amazon and a number of other, sometimes cheaper, online retailers. Shop around. The book is written and compiled by the Nazarene Project (editor David Price) and published by Bron Communications. The project derives its name from the early disciples, who were known as the Nazarenes, before they were first called Christians in Acts 11:26. The book covers a very wide spectrum of early church history, showing how the early church was hijacked and transformed into what today is the biggest church on the planet. Jerome was just one figure who was instrumental in this transformation. Even down to the smallest detail. Jerome, for example, “invented a complex and flawed theory that James and the other children were not children of Mary but rather the nephews of Jesus, a theory that had no historical or patristic basis” (p. 321). Yet this seemingly minor change led to profound doctrinal changes, including the much later doctrine of the Immaculate Conception, under Pope Pius IX, in the latter half of the nineteenth century. After the death and resurrection of Jesus Christ, the church was headquartered at Jerusalem, under the leadership of James, Christ’s brother. Early historical documents show that James had a throne in the Temple. His epistle shows that he was both a servant of his brother, Jesus, and leader of the twelve tribes scattered abroad. A contemporary record says that James “prayed inside the Holy Place every day for the repentance of Israel,” and that “Peter and the others called him Lord.” Clearly, he was a powerful and influential man, at a time when most people believe that Peter was pope. But Jerusalem, not Rome, was then the focus of peoples’ loyalties. At almost 700 pages of text, the book is a really good read and will be a useful tool to your daily Bible Study. It will also inspire many sermons for those of you who have the opportunity to speak.